Single Tank Dive – Single tank dive in the morning or afternoon. We leave at 9:00 am, 11:00 am and 2:00 pm. 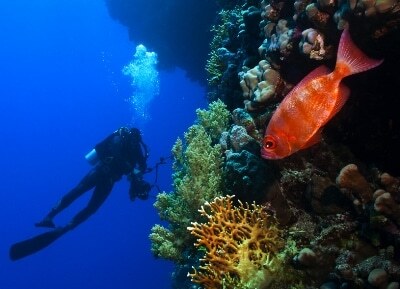 The dive takes place at various sites outside the barrier reef. Includes tank and weights. Two Tank Dive – Two tank dives either in the morning or afternoon. We leave at 9:00 am and 2:00 pm. The dives take place close to our dive shop just outside the barrier reef at various dive sites with the surface interval at our shop. Dives include tanks and weights, and refreshments on our dock between dives. Night Dive – This single tank night dive leaves our dock at approximately 5:30 to 6:00 pm to Hol Chan Marine Reserve or Tuffy Canyon outside the reef. Includes flashlight, tank and weights. Basil Joes Three Tank Dive – We start at 8:00 am, and cruise along the north reef of Ambergris Caye. Your first dive of the day will be at Sandy Point, a dive site well known for its incredible tunnel formations. This dive starts off at about 50 feet at the entrance of the tunnel and slopes down to a maximum depth of about 100 feet. At the end of the dive, you are welcomed aboard with purified drinking water, a fresh tray of fruits and snacks. Your surface interval will occur while cruising to your second dive of the day. This trip includes tanks, weights, fruit, snacks, beverages, and pick up and drop off at your resort’s dock. A $5 USD park fee is not included in the price below. Blue Hole – We start the day with a 5:30 am pick up at the PRV dock, and return to our dock for a light breakfast, coffee and juice. We then depart at 6:00 am for our first stop where you will dive the famous Great Blue Hole located in the middle of the Lighthouse Reef Atoll, followed by dives at Half Moon Caye and Long Caye. These dives are all spectacular! We arrive back about 5:30 to 6:00 pm. Turneffe Atolls – Due east of Belize City and minutes beyond the Barrier Reef lies the Turneffe Islands Atoll. The largest of the three atolls located off the coast of Belize, Turneffe is made up of more than 200 islands. It is 32 miles long and at its widest point is nearly 10 miles wide. Due to its proximity to the mainland, one would think that the diving there would be more popular, but in fact, Turneffe is the “forgotten atoll”. 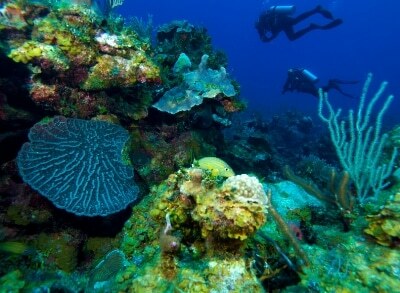 For this very reason, Turneffe has some of the most pristine diving in Belize. All of PADI’s online courses can be found at the PADI eLearning Center, and the price is only $120 USD per course. 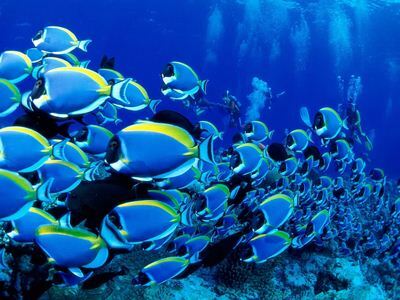 Discover Scuba Resort Course – This course is an introduction into the world of diving. 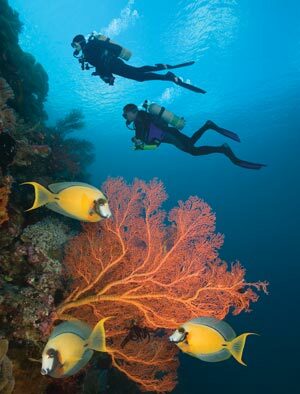 It is designed to see if you would like to pursue the adventure of becoming a certified diver. The course includes the viewing of a training video, learning about and setting up the dive gear, learning basic dive skills, and a one tank dive (normally at Hol Chan Marine Reserve). Scuba Diver Course – In this course you will be certified to dive to a maximum depth of 40 feet. Requirements include viewing an instructional video, taking a multiple choice test from material in the first three chapters in the “Open Water Manual”, confined water skills instruction, and two open water dives. This is a two day course, and includes a manual, a PIC fee, and use of dive gear. Open Water Diver Course – Become a certified PADI Open Water Diver! This course includes the viewing of an instructional video, a multiple choice test from material in the first five chapters in the “Open Water Manual”, confined water skills instruction, and four open water dives. This is a three day course which includes a manual, a PIC fee, and use of dive gear. Open Water Dive Referral Course – Become a Certified Scuba diver! Do your classroom work and confined water dives at home, and then bring your referral to us to finish up your certification with the four required open water dives. The price below includes use of dive gear and a PIC fee. Open Water e-Learning Referral Course – Become a Certified Scuba diver! Do your classroom work on line, and then bring your referral to us to finish up your certification with confined water skills instruction and four open water dives. The price includes use of dive gear and a PIC fee. 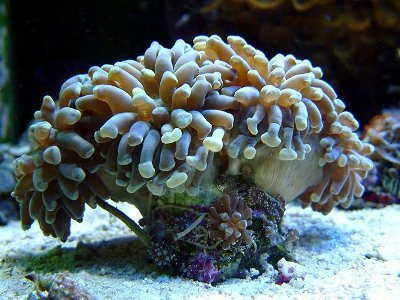 Scuba Refresher Course – If it has been some time since you have dived, and you feel the need to go over your skills, this refresher course is for you. This course includes classroom work and one dive. Advanced Open Water Course – Take a big step up to the next level in your diving education, and become a better diver! This course includes classroom sessions, and five open water dives with deep diver and navigation being mandatory dives. You may choose from night dive, peak performance buoyancy, fish identification, boat diver or other specialty for your last three dives. The price below includes use of dive gear, a manual and a PIC fee. Rescue Diver and ER Course – Take another big step up to the next level in your diving education, and become a much better and safer diver! This course includes classroom sessions, confined water dives, and rescue scenario dives. The price below includes EFR certification, use of dive gear, a manual and a PIC fee. Dive Master Course – Go from a recreational diver to a PADI dive professional who can be employed to lead dives for a dive center. This is a four week or more course which includes an apprenticeship in our dive center. The price below includes use of dive gear, manuals and a PIC fee. Enriched Air (Nitrox) Course – Learn the ins and outs of diving with oxygen enriched air. Enjoy longer dives and a reduction of nitrogen in your blood. Includes classroom work and PIC fee. Books are not included. Emergency First Reponse (EFR) Course – Learn the basics about what to do in an emergency situation while professional help is on the way. This is a half day classroom course, and includes a manual and $30 PIC fee.